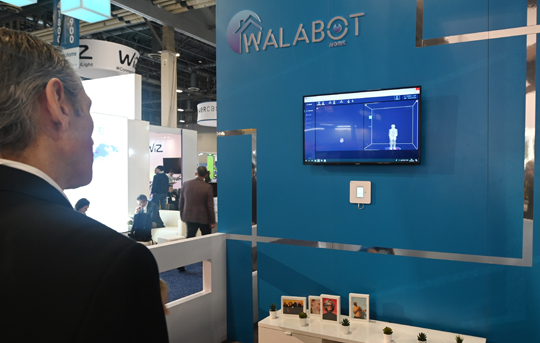 Las Vegas—With artificial intelligence to detect falls, virtual reality to combat isolation and “powered” clothing to assist the incapacitated, the tech world is stepping up its effort to “disrupt” aging. Some systems took a page from the gaming world of youngsters to help seniors “travel” to new places and connect with loved ones. “Everyone knows seniors get lonely but that isolation can also lead to a lot of medical problems, including the acceleration of dementia,” said Kyle Rand, founder, and chief executive of Rendever, a startup which works with assisted living homes to give seniors a way to virtually visit remote locations. “You can step into a virtual living room (with a friend or family member and just hang out,” said Cezara Windrem, the AARP product manager for Alcove. “You don’t need to wear anything, there are no cameras,” said Ofer Familier, head of business development for Vayyar. “We can detect falls, but the predictive aspect of it is to monitor changes in behavior so we can alert family members,” Familier said. With the data gathered from the device, “we can classify people as high-risk or low-risk fallers,” said David Keeley, research director for Addison parent firm SameDay Security. “We can passively and unobtrusively monitor the daily activities of seniors, and our predictive tools can help identify if they are at risk of falls, depression, malnutrition or urinary tract infections,” said CarePredict’s Jerry Wilmink. Tech firms see a promising market in these kinds of devices, with public attention focused by the Apple Watch’s feature of fall detection. According to research firm eMarketer, Americans of age 55 and older are the fastest-growing group of electronic wearable users in the US, largely due to the devices’ enhanced health features. For those with mobility issues, the California startup Seismic unveiled its wearable tech body suit which can augment a user’s muscles and help them maintain posture. The “core wellness suit,” which weighs under five pounds and can be worn under street clothes, has robotic components that provide up to 30 watts of power to each hip and the lower back to support sitting, standing, lifting, or carrying—similar to an exoskeleton but without the bulk. Thomas said tech products for seniors should not be “stigmatized” with unsightly products. “We should be designing with age in mind but without the ageist perspective,” Thomas told a CES panel.